The small town of Herend (German: Herendau) which is located close to Vesprém is famous for its porcelain factory. 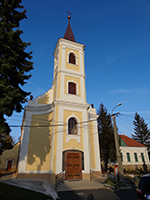 The Zichy family resettled the depopulated area with Bavarian migrants in the 18th century. The German migrant Vince Stingl founded the factory in 1826 to produce crockery. Soon, it was used for the production of china as well. Since Stingl frequently had problems acquiring financial capital, he was joined in his business by Mór Fischer who was one of the largest creditors in the region. In 1839, the business went to him completely and Mór Fischer made the company internationally renowned. Until 1840, the business had almost no impact on the local population, since only few workers from the village were employed there. Most of the skilled workers were recruited from Austria or Czech. In 1851, the company had its international breakthrough, when Queen Victoria of England ordered several pieces of an exotic set. During the interwar period, Herend changed significantly. The agricultural village turned into an industrial town and soon consisted of traditional small business owners as well as mining and factory industries. In the early 20th century, the porcelain factory, which had been founded anew as a stock company, needed more and more employers. Thus, the company came to give the people of Herend financial security. In 1948, eleven families were displaced and had to flee to eastern Germany. Today, one can visit Herend’s porcelain museum and get a glimpse of the production processes. 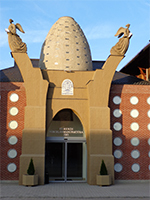 The museum also commemorates Mór Fischer and the workers of German origin. The Catholic church, devoted to Saint Eustachius, has a porcelain window which is globally unique. It shows an image of Saint Elizabeth. LEFT: Church Saint Eustachius with its unique porcelain window of Saint Elizabeth. 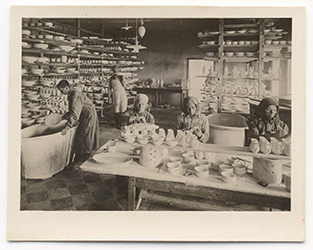 Men and women working in the porcelain factory.